Home Nutrition What Effect Does Caffeine Have on People with ADHD? In a person with attention deficit hyperactivity disorder, chemical or physical differences in the brain can lead to a variety or a combination of symptoms, including inattention, hyperactivity, and impulsivity. Attention deficit hyperactivity disorder (ADHD) is a brain disorder that is estimated to affect between 5-11 percent of children in the United States. Most people can have trouble paying attention or settling down at times. For a person with ADHD, these symptoms can interfere with normal development or daily life. The symptoms are severe and occur frequently. ADHD often starts during childhood, but it can occur at any age. Many adults may have ADHD, but the number is unknown because it is likely that only a small percentage receive a diagnosis. Caffeine may be similar to some ADHD prescriptions that are stimulant-based, but it may not be safe for everyone. Because most ADHD prescriptions are stimulant-based, it may seem strange to use caffeine as a treatment. The usage may depend upon a person’s age, health status, and how severe their symptoms are. A study in European Neuropsychopharmacology suggests that caffeine could be useful as an ADHD treatment, as it appears to normalize levels of dopamine and improve attention in people with ADHD. Another study in Medical Hypotheses suggests that caffeinated tea may help adults with ADHD. Most foods and drinks contain varying amounts of caffeine. A person may not know exactly how much caffeine they are getting from food or drinks. Even brewed coffee or tea can vary greatly in its caffeine content from cup to cup. This can make it difficult to measure how much is needed, or how much is too much. Caffeine alone may not be enough to treat ADHD. ADHD medications contain higher, controlled doses of stimulants designed to treat the disorder. Consuming caffeinated foods and drinks may not be enough, especially for people who have more severe cases. Adding caffeine to ADHD medications can cause stimulant overload. Using caffeine alongside a stimulant medication may result in too much total stimulant intake. This increases the risk of adverse effects. Stimulants can be safe and effective as an ADHD treatment, but they are not safe for everyone. These side effects are more likely to occur if a person has high amounts of a stimulant, or if they consume much more than usual. Some people are more sensitive than others to caffeine and stimulants in general. Studies suggest caffeine may affect children’s growth and development. The advice of a healthcare professional should be sought before using caffeine as an ADHD treatment. Caffeine should only be used as an ADHD treatment in children and teenagers with a doctor’s guidance. The Academy of Nutrition and Dietetics say many kids are already exceeding a healthy level of caffeine consumption, mostly through soda. The U.S. Food and Drug Administration (FDA) have not stated set limits, but the Canadian government recommend not exceeding 45 milligrams (mg) for 4-6 year-olds, 62 mg for 7-9-year-olds, and 85 mg for 10-12-year-olds. A 12-ounce soda contains 30-48 mg of caffeine. A study in Neuroscience and Biobehavioral Reviews suggests that caffeine could affect children and teens differently from adults. Caffeine-containing beverages such as soda can interfere with growth and brain development through disruption of sleep and lack of proper nutrition. A report in the journal Canadian Family Physician states that caffeine consumption among children and teens with ADHD can be dangerous, potentially raising the heart rate and blood pressure. ADHD can cause an increase in risky behavior, and combining caffeine with alcohol may be an issue for children and teens with ADHD. Caffeine can mask the effects of alcohol, so a person may drink more of both substances than is safe. The American Academy of Pediatrics recommend not giving children energy drinks, as the high levels of caffeine and other stimulants they contain can cause serious health problems. Seizures, heart problems, and mood or behavior issues have been reported after consuming these beverages, according to the journal Pediatrics. Children with ADHD have more sleep problems and daytime sleepiness, according to a study in the journal Sleep. Since caffeine and other stimulants can interfere with sleep, parents should limit its use to morning hours, or eliminate it from the diet altogether. 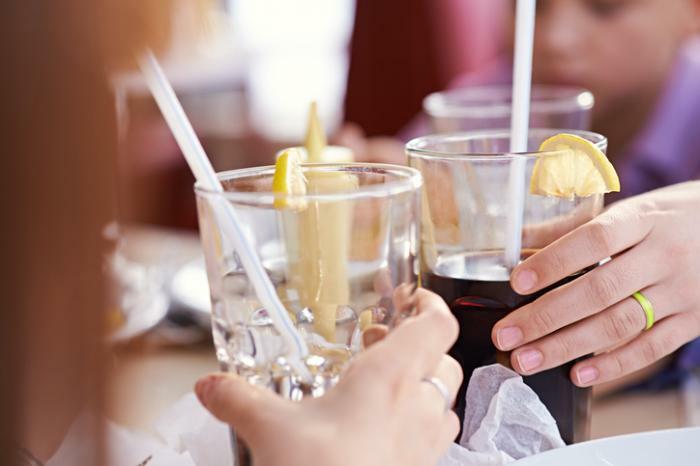 Soda and sweetened coffee drinks may contain high amounts of sugar. There may be other health considerations to make before using caffeine. Regular soda contains caffeine, but the added sugar can easily exceed the recommended daily intake. The American Heart Association (AMA) recommend no more than 25 grams of sugar daily for children, 24 grams for women, and 36 grams for men. A 12-ounce can of soda contains 39 grams. Too much sugar can lead to obesity and dental cavities, and it adds no nutritional value to the diet. Soda is not the only source of excess sugar. Sweetened coffee drinks and sweet teas may also contain high amounts of sugar. Unsweetened black or green tea as well as unsweetened coffee are caffeine sources that do not contain added sugar. Diet soda contains artificial sweeteners as an alternative to sugar, but it should be consumed in moderation. The American Academy of Pediatrics do not specifically advise against using diet soda, but do recommend water as the primary source of hydration for children. A report in Diabetes Care suggests using artificial sweeteners in moderate amounts. More research is needed on artificial sweeteners before recommendations can be made on their use. Caffeine is the most widely used drug in the world. It may hold promise as an ADHD treatment, but it should be used carefully and with a doctor’s guidance, especially in children. People with ADHD may be treated with therapy, medications, or both. Many ADHD medications contain a stimulant, which increases activity in the nervous system. Stimulants increase the brain’s levels of dopamine and norepinephrine. These two chemicals are important for focus and concentration, and it is thought they may be lacking in people with ADHD. Caffeine is the best-known stimulant in the world, but the stimulant found in ADHD medication tends to be stronger than a cup of coffee or tea. Stimulants normally make people more hyperactive and jittery, but for people with ADHD, they often have the opposite effect. They relieve the symptoms of ADHD by increasing focus and memory, and reducing hyperactivity and impulsivity.